​This list contains both on-line classes as well as free videos. 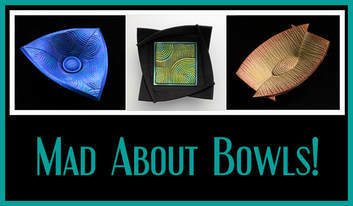 Over 90 minutes in length, this technique-based class is packed with instructions, ideas and inspiration for making your own unique handcrafted one-of-a-kind texture sheets. There are 33 individual step-by-step demos for creating specific patterns across the 6 categories of texturing techniques. Once you enroll for a free trial, you can see the first (of 9) videos free. Click on the image to access the class. 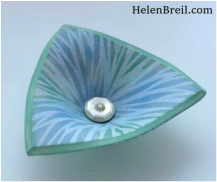 Detailed instructions are given for these 3 unique bowl projects in this 90 minute video class. Using the Thinkific learning platform, this class is broken down into 14 separate and easy-to-navigate videos and 6 supporting PDF's. Once you enroll for a free trial, you can see the first 2 (of 14) videos free. 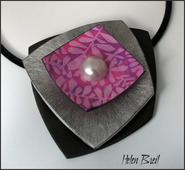 Using the Thinkific learning platform, this class, with 18 videos and 8 PDFs, will cover the making of this pendant as well as additional surface techniques. 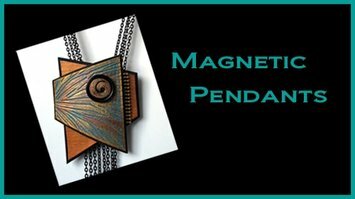 This class is full of examples of inspirational pendant designs including their shape templates. Click here for the class preview. A Craftcast Video Class with instructions on how to create these striking 3 dimensional wrap bracelets.